For the past seventeen years Michael and Alexandria along with Michael’s parents and brothers families have successfully built up and run Green Line Turf Supplies Pty Ltd. Their story has been a true rags to riches episode, meeting many of life’s challenges along the way to become a well renowned giant in the turf industry winning many awards for excellence in their field of expertise. Not content to rest on their laurels the Principals of Green Line Turf Supplies Pty Ltd have recently undertaken to expand their business. Michael and Alexandria Muscat have formed their new business and turf farm Green Life Turf and are steadily moving forward forging a new name in the industry with integrity, assured quality of their products and a commitment to the care and service of their customers. Green Life Turf has won the 2013 Australian Achiever National Award for Australia's Landscape, Nursery & Garden Services & Supplies, having previously won this distinction in 2009. Now in their 15th year, the Australian Achiever Awards are an independent, unbiased award system based on assessment ratings from companies' own clients - and are therefore an indication of a well run, healthy business, worthy of patronage. The award focuses on seven criteria, namely: Time Related Service, Addressing Client Needs, Care and Attention, Value, Attitude, Communication and Overall Perception. The criteria are rated individually in percentage terms and the final score is an amalgam of these. Anything above 80% overall is regarded as exceptional and reflects outstanding customer service. Green Life Turf achieved a 98.94% overall score for Customer Service and Relations, topping all other Landscape, Nursery & Garden Services & Supplies businesses. The 2013 Australian Achiever Award proves Green Life Turf delivers on the promise of customer satisfaction. Michael and Alexandria have a lifetime history in agricultural farming and draw on over 20 years experience in the turf industry. Green Life Turf operates with a team of 10 staff which includes their three sons Patrick, Justin and Joshua. They specialise in growing and delivering the highest quality instant lawn to their landscapers and to the commercial and retail markets. From the beginning it has always been their number one priority to ensure all their customers receive the highest standard of service. Having a staff of likeminded people who bring a high degree of experience and professionalism to the team results in customer satisfaction every time. The staff at Green Life Turf work to ensure that their lines of communication with me are always kept open, they are very respectful and ensure that I am always kept in the know, which makes me very happy. They are a very good business to deal with. Green Life Turf are fantastic to deal with. They have an excellent product and excellent delivery times, which is why I continue to use them after so many years. I would not use any other turf supplies. On top of that, their communication is second to none. Green Life Turf are fantastic at sticking to their promised delivery times - they are rarely late, but if by chance they are running late maybe even by only 10 minutes, they call me to let me know, which I appreciate. They have great customer skills and I'm happy to say that they still, to this day, send me wine for Christmas, I find that great and it shows they appreciate my business. Green Life Turf in Windsor treats clients the best in New South Wales. 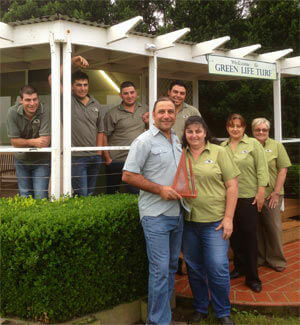 Green Life Turf in Windsor has won the 2009 Australian Achiever Award for the NSW's Landscape, Nursery and Garden Supplies category. Now in their 12th year, the Australian Achiever Awards are an independent, unbiased award system based on assessment ratings from companies' own clients - and are therefore an indication of a well run healthy business worthy of patronage. The award focuses on seven criteria, namely: Time Related Service, Addressing Client's Needs, Care and attention, Value, Attitude, Communication and Overall Perception. The criteria are rated individually in percentage terms and the final score is an amalgam of these. Anything above 80% overall is regarded exceptional and reflects outstanding customer service. A list of over 4,000 businesses who have achieved this standard can be viewed at www.achiever.com.au. Green life Turf achieved a 100% overall score for Customer Service and Relations, topping all other NSW Landscape, Nursery and Garden Services businesses. 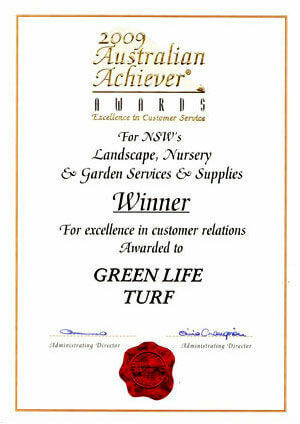 The 2009 Australian Achiever Award proves Green Life Turf delivers on the promise of customer satisfaction. 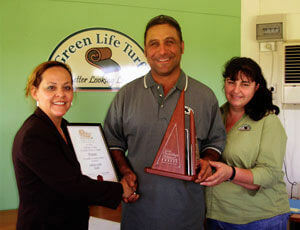 After 20 years in the turf business, Michael and Alexandria Muscat established Green Life Turf in 2007. The business now operated with a team of 8 and specialized in wholesale and retail supply of quality instant lawns to Landscapers and the domestic market. Donna, who takes the phone orders, has always been very efficient and accurate. We have never had any problems with delivery and they have never let us down. I am a landscaper so, sometimes I ask for the turf to be supplied and laid as well, and they will arrange that for me. Their communication is excellent, they are professional, the price is competitive and the driver is polite and friendly. He not only comes with the turf, but also with all the paperwork invoices and quality assurance as well. We find him excellent to deal with. Green Life Turf exceeds all my expectations for my requirements. They provide a quality product, their customer service is excellent and they give good advice. We are a landscaping company and purchase turf off them. We find them professional, friendly and polite and good to deal with. Having worked with this company for over 15 years I find them to be honest, trustworthy people who understand my needs. The quality of their turf is second to none and their customer service is excellent. Donna communicates exceptionally well with everyone, has everything organized and keeps us all on our toes. Green Life Turf is excellent to do business with.